(Asheville, NC) – Catawba’s Festbier surfaced at Gauley Fest 2016, a fall festival famous among paddlers as American Whitewater’s biggest fundraiser for river conservation nationwide. Brewed in their Asheville pilot brewery, this crowd-pleaser established an early high-water mark for the first year of Catawba’s Small Batch Program. Festbier makes its triumphant return in 2017 to honor another fall festival – the world’s original beer fest. This authentic German-style lager is a gateway to the celebration, from Munich to Morganton. Brewed according to modern day Bavarian standards, the Catawba Festbier represents a lighter, more sessionable evolution of the classic Marzën style. This easy-drinker showcases its distinctive Vienna malt character. Balanced with a touch of Noble hop bitterness, it finishes smooth and clean. 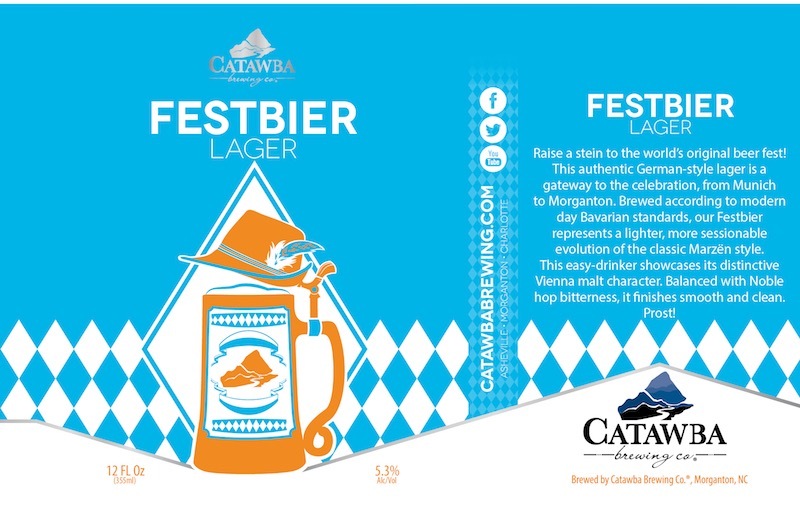 Now brewed in Catawba’s Morganton production facility, Festbier makes its debut in 5-state distribution in 2017. No stein should go unfilled! Find it on draft and in 6-pack cans wherever Catawba beers are sold, from mid-August through September. Festbier festivities will commence at Catawba’s four tasting rooms on Friday, August 18.